Leyla Pirnie, a graduate student at Harvard, came home from a weekend and found that her Massachusetts roommates has rummaged through her private room, looking for guns. 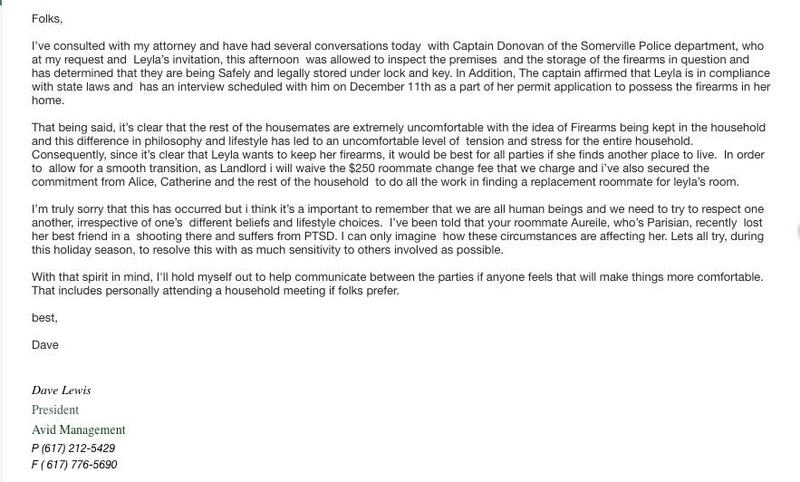 After they found them, they contacted the landlord and the police, but now the landlord is evicting her because the roommates are “uncomfortable” and have “anxiety” over the fact that the Pirnie owns guns. The self-meddling has caused a national outrage, as the landlord has given Pirnie two options: either pay the full rent and rent the house alone or get out. After sneaking in and searching her room like rats while she was away, the roommates contacted the landlord asking him to contact the police. Lewis contacted Captain James Donovan of the Somerville Police Department to inspect Pirnie’s firearms and ensure they were in compliance with Massachusetts law. Pirnie agreed to allow the police to inspect her firearms, which were perfectly legal. 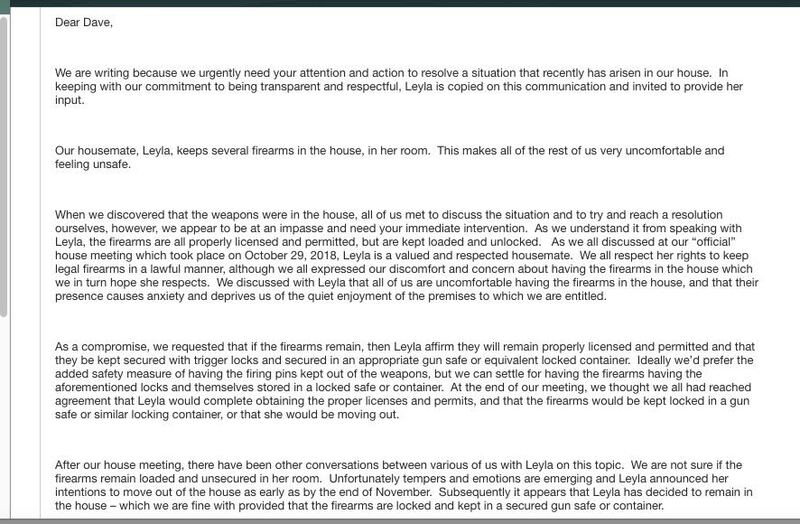 “We discussed with Leyla that all of us are uncomfortable with having firearms in the house and that their presence causes anxiety and deprives us of the quiet enjoyment of the premise to which we are entitled,” one roommate wrote in an email to the landlord. Dave Lewis, president of Avid Management, then requested Pirnie to vacate the premises, despite the authorities’ assurances that she complied with all gun-ownership laws. “Since it’s clear that Leyla wants to keep her firearms, it would be best for all parties if she finds another place to live,” Lewis wrote in an email.